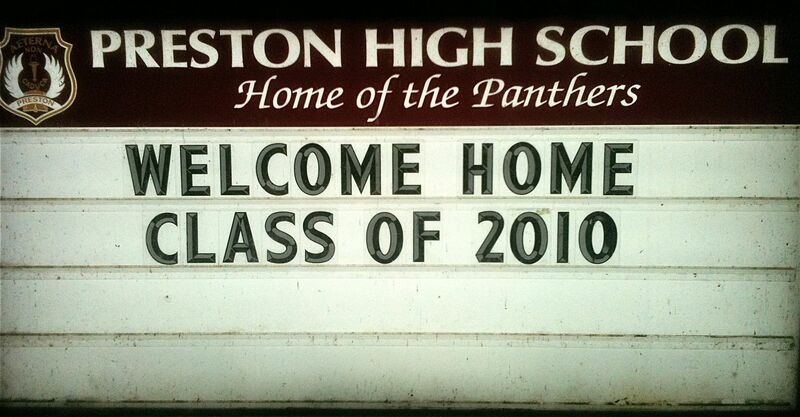 Last weekend I attended commencement at my old school, Preston High School. To avoid confusion, I should point out that this is not the same Preston High School that Napoleon Dynamite went to, although that would have been pretty cool. I know it’s cliche to say something like “it brought back lots of memories”, but really, what else can I say about a place that was such a big part of my life? To be fair, I think my connection with the school is a little deeper than might be typical. When my dad died nine years ago, friends and family generously donated over $5,000 to create an award in his name. It’s been handed out every year since 2001 to a graduating student who has made a major contribution to the music department through his / her years at PHS. This marked the final year for the Ken Dearlove Memorial Award, and I wanted to be there with my brother to make the presentation. The commencement ceremony itself was very well done. It was fun to be back in the old gym and listen to the accomplishments of the students. The valedictory address was particularly memorable – it was a little humbling listening to this young guy deliver a speech that was much funnier and inspiring than one I could have hoped to write. After it was over, Kyle and I ducked into the old music room. Nothing much has changed – it still has the same basic set-up, and the old sinks are still there from when it was a classroom for aspiring hair dressers. It was the first time since my dad died that I had been in that room, a place where he had spent so much of his life, and I think I secretly hoped it would still bear some trace of him a decade later. We stayed for a minute, and then continued our walk down memory lane, stopping for cookies and punch along the way.